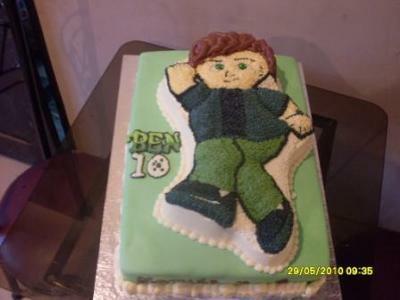 My nephew wanted a Ben 10 cake for his 6th birthday at all cost and I searched everywhere and could not get a Ben 10 baking pan so I cleverly used a Diego baking tin and came out with this with the help of a Ben 10 picture I saw on my son's toy. That is an EXCELLENT job! You need to send that to Wilton! They can add it to the pan directions. That is AWESOME!!!!! !